In 1944 Phyllis Burns became the school’s first full-time employee; she was appointed as Assistant Director and Registrar and was responsible for teaching classes in child and family welfare. In 1949 Lawrence T. Hancock was appointed as the first regular Director of the School, a position he held until 1973. It was during his tenure that the school amalgamated with Dalhousie University in 1969 and received accreditation in both Canada and the United States. Initially falling under the auspices of the Faculty of Administration, the Maritime School of Social Work is currently one of eight schools and a college grouped within the university's Faculty of Health Professions. The political, social, cultural and economic conditions of the region continue to give direction to the school's teaching; specifically, its degree and certificate programs were designed to meet the needs of the region's Mi'kmaq population. It has maintained an affirmative action admissions program since the mid-1970s and makes special efforts to accommodate the diversity of its student population. In the early 1980s the school added a Bachelor of Social Work (BSW) degree program, while the Masters program (MSW) was reorganized into a one-year course of study for BSW graduates. With the advent of the BSW program, an off-site program was developed to reach students in Sydney, Saint John and Charlottetown. Since 2001 the school has offered distance delivery to students across Canada via the Internet. It also provides a continuing education program for practising professions, including workshops and certificate courses in the practice of social work. The fonds consist of records that document the administrative and operational activities of the Maritime School of Social Work. These include general correspondence, committee minutes, financial records, reports, statistics, program information, course materials, examination records, newspaper clippings, memorabilia, photographs, as well as documentation of relationships with outside organizations. All records are administered in accordance with applicable federal and provincial Privacy and Freedom of Information and Protection of Privacy legislation. Questions about access should be directed to the University Archivist. 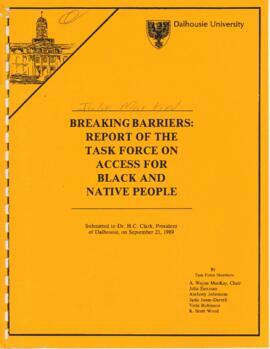 A database describing this collection is available in the Dalhousie University Archives for staff use only. Preferred citation: [Identification of item], Maritime School of Social Work fonds, UA-22, Box [box number], Folder [folder number], Dalhousie University Archives and Special Collections, Halifax, Nova Scotia, Canada.